What to Expect This fast-paced, escorted tour involves a significant amount of walking or hiking, often on uneven terrain, requiring a high level of physical fitness to fully enjoy the trip. Note the infrastructure in some areas of Borneo is limited as roads may be bumpy with few rest stops. 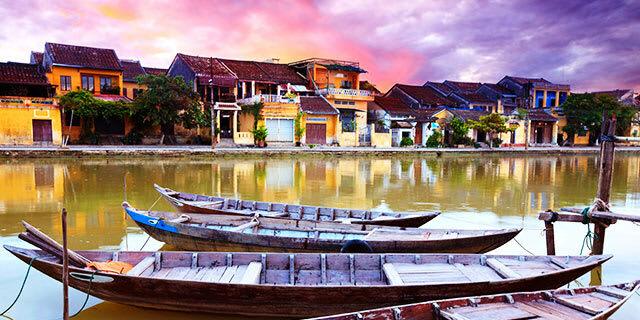 If you've been dreaming of a vacation to Southeast Asia, then this is the tour package for you! Your journey begins on the island of Borneo, where a mosaic of indigenous tribes, intriguing history, ancient rainforests, and diverse wildlife await. 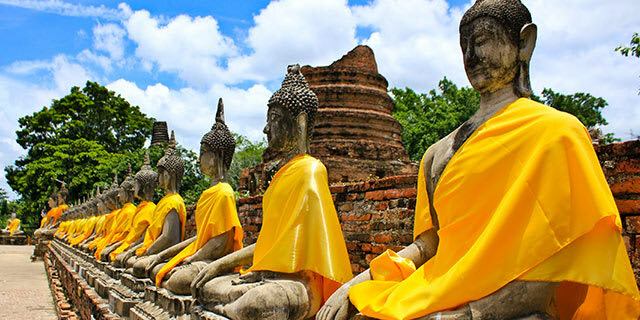 Your discovery of this fascinating region continues in Thailand, where you'll enjoy a few days in the bustling capital city of Bangkok and visit to the Royal Grand Palace. Top off your visit by taking advantage of your already-included airfare and joining our optional extension to Phuket Island, Thailand's most famous resort. 1. Malaysia 'Tourism Tax' was implemented September 1, 2017. The fee is 10 MYR per room, per night and payable directly to the hotel upon check-out. USD amount listed is an approximation of the total cost per person based on 4 nights, double occupancy: 40 MYR. Fee is paid in MYR. 1. Malaysia 'Tourism Tax' was implemented September 1, 2017. THe fee is 10 MYR per room, per night and payable directly to the hotel upon check-out. USD amount listed is an approximation of the total cost per person based on 2 nights, double occupancy: 20 MYR. Fee is paid in MYR. 1. For flights from LAX, upgrades may be available to Premium Economy starting from $1,000 and to Business Class starting from $4,000. For actual prices and availability from this or other cities, please make your request during the reservation process so that our air team can check the availability and provide you with the exact rate for your chosen travel date. Rates and space are subject to availability with the airline, an increased deposit may be required to confirm a seating upgrade. Your fascinating journey begins tonight as you check-in for your flight bound for Malaysia. Accommodations: 2 nights Hilton Kuching or similar. Full Day Itinerary: Sightseeing begins today at Bako National Park, one of the best places in Sarawak to see wildlife in its natural surroundings. After arrival at Bako, a Malay fishing village built on stilts over the river, enjoy a 30-minute cruise on the South China Sea to this remote coastal park. Millions of years of erosion have sculpted a coastline of steep cliffs, rocky headlands, fantastically shaped arches and seastacks, and stretches of beautiful white, sandy beaches. The park is a unique botanical treasure housing 25 distinct types of vegetation that form seven complete ecosystems. Your local guide will help you to explore on well-marked jungle trails. Accommodations: 2 nights Aiman Batang Ai Resort & Retreat or similar. Included meals: Breakfast, lunch & dinner. Full Day Itinerary: Today's touring begins with a short, scenic drive to the Semenggoh Orangutan Rehabilitation Center. Established in 1975, this 1800-acre virgin forest provides sanctuary to some of Malaysia's most protected wildlife, including hornbills, monkeys, and especially, orphaned or rescued orangutans. At the center, the orangutans are carefully nurtured and rehabilitated for eventual release into the jungle, their natural habitat. You will have the opportunity to learn about the rehabilitation process and to observe and photograph the orangutans from a distance. Note: Since the orangutans in Semenggoh are semi-wild, sightings cannot be guaranteed. From Semengok, proceed to Batang Ai. 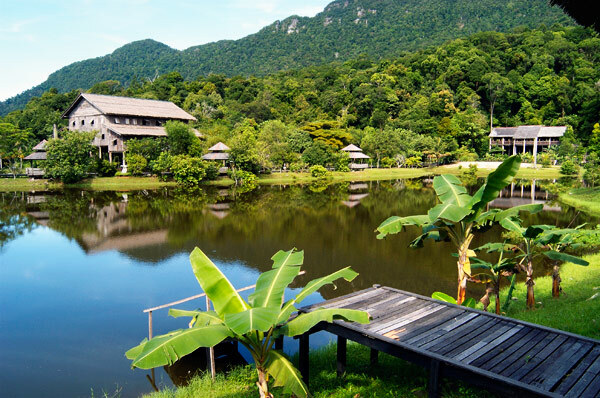 After lunch in the small town of Lachau, sit back and enjoy the rest of the drive through the scenic countryside of rice fields, cocoa and rubber plantations, luxuriant tropical rainforest, wild orchids, and mountain ranges. Travel by boat across the Batang Ai Reservoir to your hotel. Full Day Itinerary: A special treat awaits you today as you take a longboat down the Engkari River to a real Iban longhouse, an entire village under one roof. Experience the legendary hospitality and charm of the locals as you learn about their fascinating culture. Join in their traditional dance and music as they welcome you with a cultural performance, followed by a blow pipe demonstration. Enjoy a picnic lunch by the riverbank or in the longhouse, depending on water conditions. Time permitting, enjoy a short trek through the jungle around the longhouse before returning to Batang Ai. Accommodations: 3 nights COMO Metropolitan or similar, Bangkok. Included meals: Breakfast. 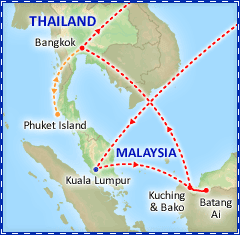 Full Day Itinerary: After breakfast, transfer to the Kuching Airport for your flight to Thailand. Following customs formalities, meet our representatives and transfer to your centrally located hotel in the heart of Bangkok, Thailand's bustling capital city. Full Day Itinerary: After breakfast, you will be picked up for the half day sightseeing to the old heritage of Siam. The tour will start with the Royal Grand Palace, Bangkok’s number one ‘must-see’ attraction as well as Thailand’s most important landmark. You will visit the main sites including the magnificent throne halls and the Emerald Buddha. Then continue to visit Wat Pho. Bangkok’s oldest temple is home to the magnificent reclining Buddha as well as the first school of traditional medicine and Thai massage and is also regarded as Thailand’s first University. Afterwards, enjoy lunch at a local restaurant. Return to the hotel for the balance of the day at leisure. Enjoy a farewell dinner with your fellow travelers. Or, take advantage of your already-included international airfare and join our optional extension to Phuket Island, Thailand's most famous resort island! Why not take advantage of your already-included international airfare and visit the bustling metropolis of Kuala Lumpur, capital city of Malaysia? You will depart the U.S. 2 days earlier than the departure dates listed. 2 nights Parkroyal Kuala Lumpur or similar, Kuala Lumpur. Full Day Itinerary: A city of contrasts, Kuala Lumpur blends modern skyscrapers with impressive historic buildings to create a unique cityscape. Today, enjoy a panoramic city tour including a photo opportunity at the Petronas Twin Towers, the world's tallest buildings until 2004, King's Palace, the National Museum, the National Monument, the Moorish-style railway station, and the superb buildings at the Independence Square, where you can observe the contrast between historical architecture and modern skyscrapers in an abundant setting of greenery. Spend the rest of the afternoon at leisure then later this evening enjoy dinner at a local restaurant and then a cultural performance. Optional Excursion: Craft Factories & Batu Caves (purchased locally). The area surrounding Kuala Lumpur abounds with cottage industries and nature reserves. See how beautiful pewter products are manufactured at the world famous Royal Selangor factory. Then stop by a batik factory and observe how this traditional fabric is designed and printed. The excursion concludes at the Batu Caves, the famous site of the annual Thaipusam festival in January and February, where almost a million devotees congregate. You'll pass a 140ft statue of the Hindu god Lord Murugan, the world's largest, as you climb the 272-steps to the top of a natural limestone cavern which houses a Hindu shrine. This optional excursion must be purchased locally and may have some slippery terrain. Why not take advantage of your already-included international airfare and enjoy a luxurious and relaxing stay on Phuket Island, Thailand's most famous resort? Accommodations: 3 nights Amari Phuket or similar. Included meals: Breakfast. Today you'll fly to Phuket, where the balance of the day is at leisure. Full Day Itinerary: Two full days at leisure to relax, shop or tour this scenic island, Thailand's largest. Phuket and the 39 smaller islands to the southeast are studded with tropical forests, mountains, gravity-defying limestone formations, and pristine beaches, surrounded by coral reefs and the aquamarine water of the balmy Andaman Sea. With warm, humid weather year-round, you'll enjoy plenty of sun-drenched days lounging on the beach and all manner of water sports, including jet-skiing, parasailing, surfing, scuba and snorkeling. Most of the dive locations are suitable for all skill levels, and the waters abound with colorful coral forests, tropical fish and other marine life, including leopard sharks, moray eels, octopus and turtles. Phuket is also the sailing and yachting center of Thailand and adjacent countries, with several races and regattas happening throughout the year. And in the unlikely event that you can pull yourself away from the beach, you'll find opportunities to ride horses or elephants, hike, mountain bike, and even golf. Afterwards, unwind at one of the many spas or one of the excellent acrobatic, theatrical or cultural shows. Join an optional tour to the breathtaking Phi Phi islands. 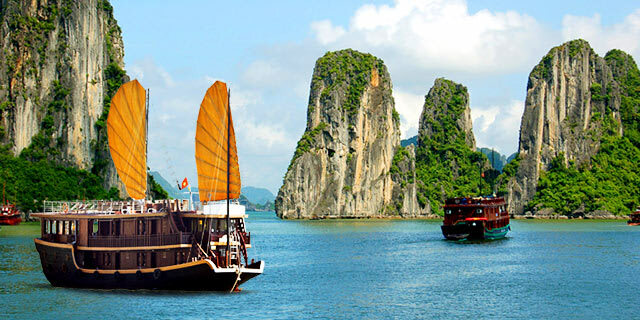 Take a trip by boat and bus to Phang Nha Bay and to the famous limestone spire known as "James Bond Island" for its role in The Man with the Golden Gun. Optional Excursion: Day Tour of Phi Phi Island by Speedboat (purchased locally). 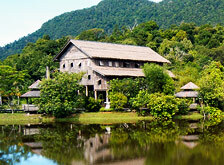 Departing this morning, escape to a quieter and more natural side of southern Thailand with this day trip from Phuket. Travel by speedboat across the Andaman Sea to the six scenic Phi Phi Islands. The journey to Phi Phi takes around 45 minutes, passing by spectacular limestone karsts that jut out from the blue seas. Sit back and relax, enjoying the views as the boat cruises closer to paradise. Continue around the islands, visiting Lho Sa Mah, Phi Phi Lay Cove and Monkey Beach. Each of these stretches of island boasts swaying palm trees and white sands. There are also calm, clear waters brimming with fish for those who wish to discover Thailand’s underwater beauty. Hidden on a secluded beach, Amari Phuket offers a prime location in Patong’s southernmost corner surrounded by the Andaman Sea. Less than an hour’s drive from Phuket International Airport, Amari Phuket is conveniently set within a 5-minute walk to Patong Beach while Phuket Town and the island’s popular attractions are also easily accessible from the resort. What should I know about Malaysia? Check out our guide for travel tips, the best time to go, blog posts, videos, and more. What should I know about Thailand? Check out our guide for travel tips, the best time to go, blog posts, videos, and more. 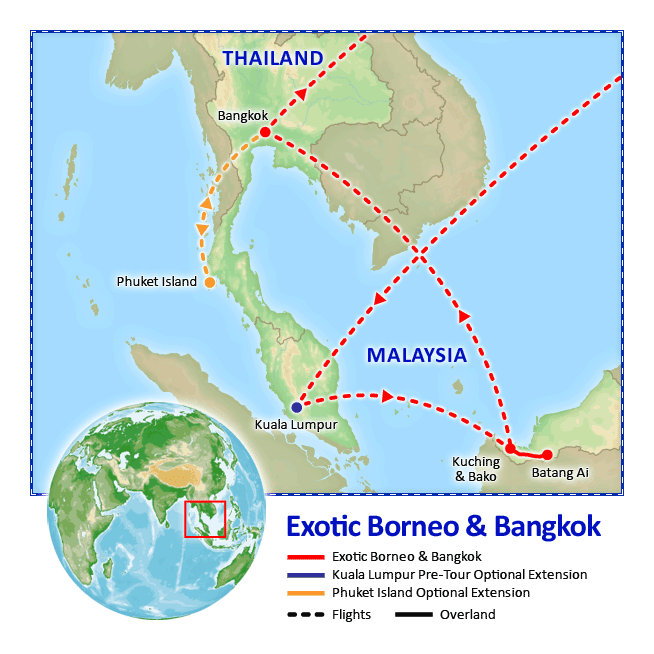 What should I know about Borneo? Check out our guide for travel tips, the best time to go, blog posts, videos, and more.